Elliotts X-Series Firefighting Apparel provides the ultimate fire protection with dexterity and comfort. Elliotts range of Protective Clothing for Firefighters incorporates the latest in fabric technologies and we are constantly re-designing garments to meet specific firefighting needs. Elliotts recommends that a firefighter's protective clothing should be comfortable, breathable, lightweight, highly visible, allow the wearer to move freely and offers overall protection in the hazardous fire fighting environment. Two piece special shaped sleeves allows for natural elbow movement. Shoulder area padded for greater comfort. Angled bellows pockets with Veclor closure, pocket flaps Incorporate AraShield pull tab for easy opening when wearing gloves. Heavy duty zipper with Velcro closure system on outside storm flap for extra heat and moisture protection. Reflective Trim - Standard trim is 50mm Firetrim. Contoured knee designed to mirror the natural shape of the leg so it is easier to bend and not restrict knee movement. Bellow side pockets with Velcro closure and drain holes,pocket flaps incorporate AraShield pull tab for easy opening when wearing gloves. 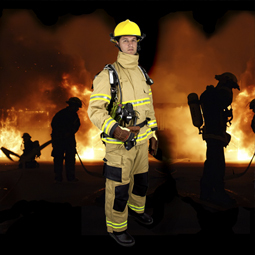 All Elliotts Firefighting Apparel is made in Australia using the highest quality firefighting materials available. We can design and customise to you specific requirements through all stages of design, material selection, safety specifications and accessories to ensure that your Firefighting Apparel is the perfect match for your Fire and Rescue Team.